Jon Corbino's legacy as an artist commenced with having a painting accepted for the annual exhibition at the Art Institute of Chicago in 1926, when he was 21 years of age. 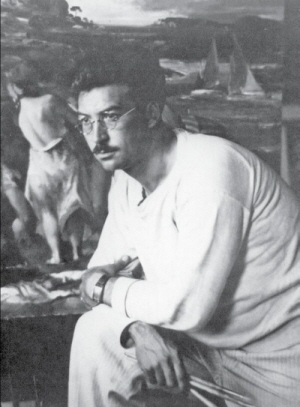 His first solo exhibition was hosted by the Allan Art Museum in Oberlin, Ohio in 1928. His first exhibition at a New York sales gallery was in 1934 at the Contemporary Arts Gallery - so fitting a comparison to having this show at Art Naples Contemporary Art Fair. During the decade of the 1930s and into the 1940s his paintings have been called "Heroic" and when the Museum of Saint Petersburg in Florida hosted a memorial retrospective exhibition in 1987, their 132 page catalogue was titled Jon Corbino - An Heroic Vision. These powerful and often large oils, depicted scenes of war, refugees from disaster, Christian events, and family gatherings. He would later find summer refuge north of Boston. His move to Sarasota, Florida in the early 1950s created change in the tonality and subject matter of his creations. 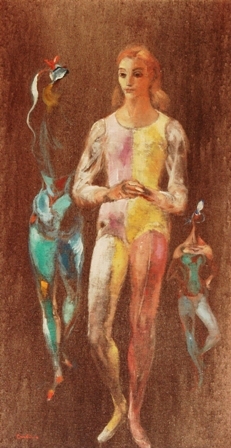 An interest in circus themes became a primary force in the works during the next decade of his life which ended suddenly in 1964. Corbino did live to see his work acquired by more than 50 museums including most of the greatest museums of this country at the time. His connection with Naples and this gallery has special meaning as well since it was his solo exhibition which officially opened the "Harmon Gallery" in January of 1964 on Third Street South. In 2010 the "Harmon-Meek Gallery" paid tribute to that event with an exhibition titled "Corbino Revisited: 43 Years Later".